This page is about the removal of raccoons inside the wall of a home. As usual, it was a female raccoon with a litter of baby raccoon pups. They were making a LOT of noise, and the residents of the house could not sleep at night. They were actually nesting in the wall right over the bed and the heads of the people living in the house. The mother raccoon tore a hole in the side of the house in order to get in. 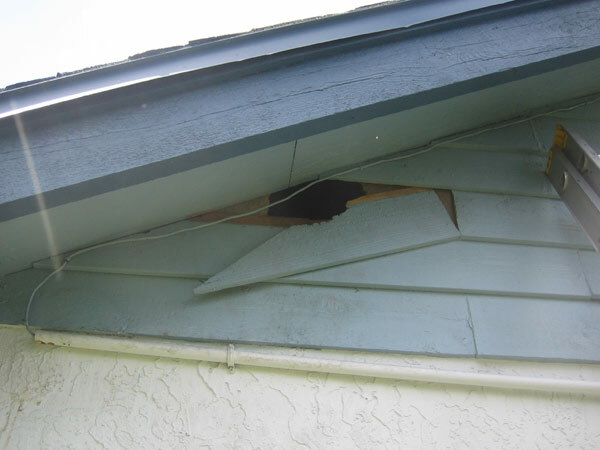 Raccoons are very strong, and can tear open a roof or wall if they want to get in. They'll usually take an easier spot, like a soffit, but they'll get in any way they can! This hole may not appear terribly large, but it never ceases to amaze me how wild animals squeeze through such tiny spots. Oh yeah - the customer tried to fix this hole, but momma raccoon tore it right open again the next night. 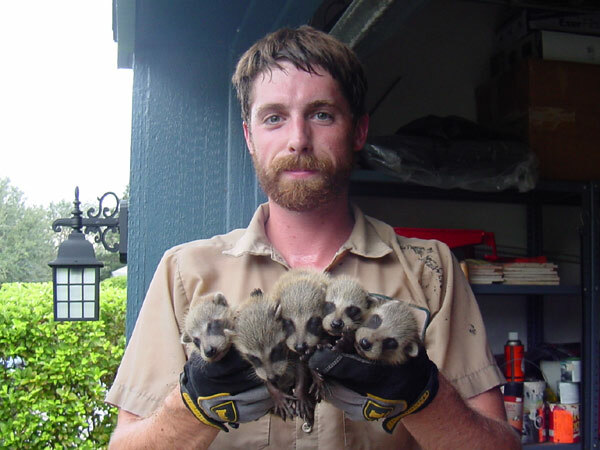 I went into the attic, and even though it was, as usual, a very hot and tight crawl, I made it to the place where the noises were heard, and sure enough, I found this litter of baby raccoons down the wall. They were very difficult to reach, but I was able to get them all using a snare pole. This was a litter of five, which is higher than the average litter of four. Sometimes the raccoon has only three, sometimes up to six. The absolute best way to trap mama - set the live babies in the trap as bait, and she'll go in every time. This method almost never fails. I make sure that they are all safe and that they all live. I am sure to relocate them all together once they get re-acclimated. Raccoon mothers are some of the best mothers in nature. They are very protective of their young. If you place the young in a cage, you'll always trap her. Nothing can separate a mother raccoon from her babies! This is an advanced wildlife trapping technique that only the pros should attempt (or even have the right equipment for). If you want to get rid of raccoons in the wall or attic, it's best to call a professional. The people living in this house were do-it-yourself type people. They figured that they had squirrels in the wall, and they were trapping every squirrel in the neighborhood with cage traps, and (illegally) relocating them to property they did not have permission to release on. They had no trapping permits. Regardless, they were wrong. They in fact had raccoons. I took one look at the hole in the wall, and I told them that this was no squirrel! I solved their problem in under 24 hours, and now they get a good night's sleep! Click here for my award-winning raccoon photo galleries. For more raccoon trapping information, go back to the raccoon control page. If you don't live in Orlando FL, click here for the National Directory of Wildlife Trappers. What to do when a raccoon is in the walls - Sometimes you have to dig a little deeper to get the raccoons out of your home. An adult raccoon will probably have the run of the attic space, but she might just have a litter of kits hidden down in your wall. As these babies grow, they’ll continue to live in the wall until it’s no longer practical. You’ll know you have raccoons in a wall because of the scratching sounds around the baseboard. Sometimes you'll hear them making vocal noises, almost like a sort of chirping sound. It’s not always possible to retrieve the critters from the inside of the building. If you’re lucky, you’ll be able to pinpoint where they are inside and cut away your dry wall to fish them out. Sometimes the critters are in an exterior wall, and a professional will have to locate the heat source from their bodies and then make a precise cut into the exterior. If you’re paying someone to remove the raccoons, chances are that person will also be a skilled repairman. If there is interior access to the wall from the attic, it might be possible to use a snare pole to pull the raccoons up and out of the space. This isn’t the normal scenario, but sometimes you get lucky. How to get raccoons out of the wall - Raccoons sometimes find shelter in the walls in most cases; they usually get stuck in the walls. You will know if a raccoon is stuck in the wall if you hear frequent scratching and high pitched noises. It is very tricky to remove raccoons out of the wall that is why the best option is to contact the professionals who will use the correct measures to ensure that they are safely removed from the walls. If it is impossible to get hold of the professionals, you can use the correct procedure that will remove the stuck raccoon out of the wall. If there are babies in the wall, then you have to be extra careful because they are a very delicate lot. If they are not stuck in the walls, then there are high chances that they will come down from the wall into the attic. 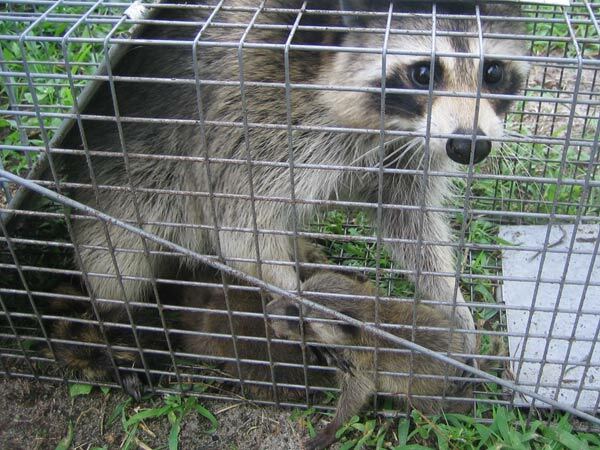 If the raccoon is stuck in the wall you can use one of the following techniques to get them out of the pole: You can lower a snare pole into the wall, if the raccoon is big enough, then it will be able to climb up using the pole and when it is at the highest point, you can grab it using your hand. 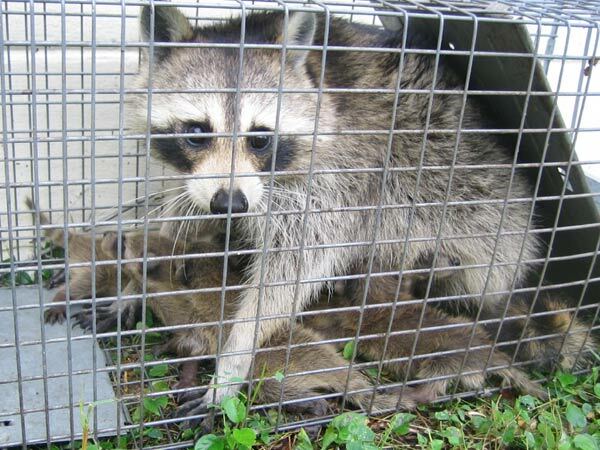 If you are scared then you can use a box to trap the raccoon and thereafter release it away from your yard. If the raccoons are still young and have no clue of how to climb up the pole, you can cut a small hole slightly above the raccoons and you have to be very carefully to avoid harming the baby raccoons. When the hole is big enough to remove the raccoons, you can wear gloves and remove them from them from the wall and take them to their mother. You have to repair the walls after removing the raccoons to avoid them from returning into the wall. If you are incapable of repairing the wall, you can seek help from the experts. Raccoons leaving in the walls - If they are not stuck but they are willingly using the wall as their habitat, you have to come up with the safest ways to get rid of them. They will definitely climb into the attic so that you can set your traps in the attic, at the entrance point into the wall. The best trap to use is a caged trap that will prevent from getting out once they are trapped. It is also the most effective technique because you will be sure when the raccoons have been trapped. You can also use repellents but they are not the most effective technique to remove the raccoons from the wall because they are likely to kill them especially if they are very lethal.